Description: Perennial herb; stems ascending-erect, (4-) 8-12 dm tall, moderately puberulent and branching on the upper half; leaves densely arranged on the stems, thick textured, elliptic-lanceolate to elliptic-oblanceolate, 4-7 cm long, 12-20 mm wide, smaller into the inflorescence, basally attenuate to a subpetiolate portion 2-3 mm long, margins shallowly crenate-serrate, surfaces puberulent and minutely stipitate-glandular; inflorescence a complex cylindric-conic to pyramidal thyrse, 25-40 cm long, 15-30 (-35) cm wide, not at all one-sided; heads turbinate-campanulate, 3-5 mm wide; phyllaries in 4-5 graduated series, lanceolate to oblanceolate, apically acute, inner 5.5-6 mm long, outer about half as long; ray flowers 11-15, corollas yellow, erect, 5-7 mm long, 1-1.2 mm wide; disc flowers 5-6 mm long, corolla lobes 2.6-3 mm long; achenes 2.5-3 mm long, 0.5-0.8 mm wide, glabrous; pappus of apically acute barbellate bristles. Flowers late August through September. Similar Species: Solidago capulinensis is similar to S. wrightii and S. petiolaris, but differs from those species in its larger stature, larger leafy inflorescence, and longer disc corollas (5-6 mm for S. capulinensis versus 3-5 mm for the other two). Distribution: New Mexico, Union County, Capulin Volcano National Monument; adjacent Colorado, Las Animas County, Mesa de Maya region, and Pueblo County (as cultivated plants). Habitat: Among boulders (basalt or sandstone), in canyons or on hillsides in juniper savannah and plains-mesa grassland; 1,520-2,290 m (5,000-7,500 ft). Remarks: This plant has an interesting botanical history. It was first collected by D.M. Andrews in 1930 at Capulin Mountain and was named by Andrews and Cockerell in 1936. Andrews sold cultivated plants from his nursery in Boulder, Colorado, for many years. Academic botanists knew this plant only from a single collected specimen and it was subsequently overlooked as either a species or synonym in both the New Mexico and North American floras (Martin and Hutchins 1980, Semple and Cook 2006). Guy Nesom, an expert on the Asteraceae, was sent a specimen of this plant for identification in 2000 and he later realized it matched the type specimen of Solidago capulinensis held at the New York Botanical Garden. The specimen sent for identification had been collected from cultivation at the Pueblo Nature Center in Pueblo, Colorado, and presumably originated from Andrewsâ€™ cultivated stock. 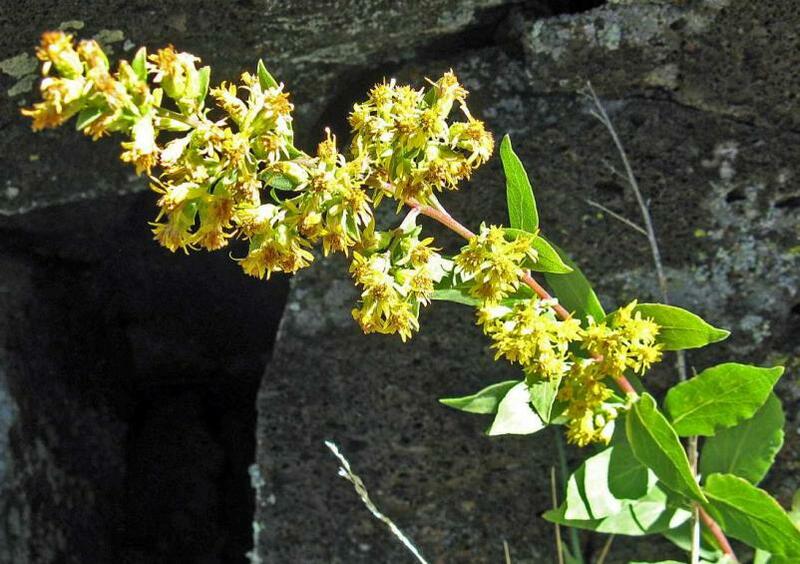 A search at Capulin Mountain in September 2010 found plants still growing there in abundance, perhaps at the exact spot where first collected in 1930 (Nesom and Lowrey 2011). Conservation Considerations: Surveys are needed in northeastern New Mexico and southeastern Colorado to determine the presence and abundance of this species and to determine if current land uses pose any threat. Plants at Capulin Volcano National Monument appear secure under current management. Martin, W.C. and C.R. Hutchins. 1980. A flora of New Mexico, vols. 1-2. J. Cramer, Vaduz. Cockerell, T.D.A. and D.M. Andrews. 1936. A new goldenrod from northern New Mexico. Torreya 36:35-36. *Nesom, G.L. and T.K. Lowrey. 2011. Solidago capulinensis (Asteraceae: Astereae) redivivus. Phytoneuron 2011-24:1-22. Semple, J.C. and R.E. Cook. 2006. Solidago, pp. 107-166 In: Flora of North America Editorial Committee (eds.). Flora of North America, Vol. 20. Oxford University Press, New York, New York.